Hi, thanks for stopping by the Labrador Retriever Guide. 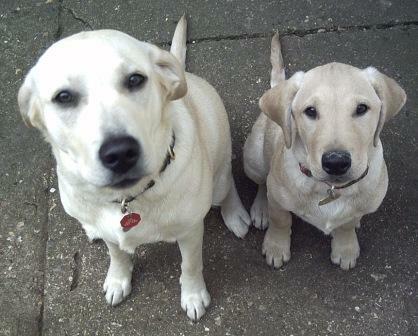 Labs are one of the most popular breeds of dog throughout the world. And it’s very easy to understand why. As the owner of two Labradors we know that the dogs reputation for having the friendliest nature and loyal instincts are well deserved. A Lab really is the most wonderful and faithful of pets. But, they do have some quirks and behaviour patterns which many people aren’t aware of! In the Lab Guide it is our intention to build the ultimate online resource for Lab owners and those looking to be owners. We will cover the history of the breed, specific health issues, and just how you should tackle the vexing question of training your new Lab. And, because Labs like nothing better than to eat their owner out of house and home we look at nutrition and anything else to do with the most wonderful of breeds. Oh, and if you feel like treating your Lab check out our recipies pages. There will also be plenty of lovely photos and videos and hopefully every reader will share his or her Labrador experiences with us. We want to build a real community here so please feel free to contribute to the site. At this point we had better explain just who ‘we’ are. I'm Cathy Doggins, the publisher behind the Labrador Retriever Guide. We have a wonderful time with our dogs at home but try, not very well admittedly, not to let these lovely dogs run our lives! It is out intention to make this site a one-stop-shop for Labrador lovers and owners throughout the world. As the site grows we will be making available many free downloadable resources as well as finding more great things to stock in our gift store.